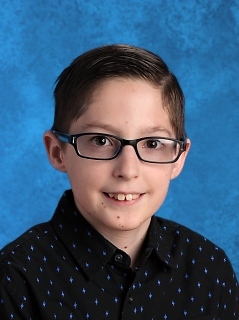 Home/News/Zach Clerisse is Student of the Month for January! Junior Academy-7 Student Zach Clerisse is the Student of the Month for January! Ms. Poppleton: He works incredibly hard, asks questions, and participates regularly in class. Zach has really started to come out of his shell, to the point o making/wearing the coolest ugly Christmas sweater last semester. I am incredibly proud of Zach and he is a great role model for his classmates as well! Mrs. Gough: Zach participates and is a pleasant, all around nice student. Ms. Nash: Zach is a polite and friendly young man. He participates readily in all class activities and strives for excellence. He arrives early every day and never needs a reminder to the task at hand. Zach clearly cares about his success and works hard toward achieving it. He has a fun sense of humor and shares his written work with enthusiasm. Not to mention, Zach’s ugly Christmas sweater was the envy of the school! Mr. Rochon: Zach is an excellent choice (for student of the month). He gives 100% effort at all times and is well perceived by all of his peers.